Vinod Gupta Charitable Foundation, in short VGCF, is an amalgam of devoted hands and strong minds for providing outstanding quality education to the next generation. The overarching aim of the foundation is to empower women and girls of marginalised groups through sustainable initiatives in the field of education, which will enable them to be economically and socially secure. It was started as a society under the Societies Registration Act XXI of 1960 in delhi on 4 th July, 1997. The foundation is first in introducing non-technical education in IIT, Kharagpur. Vinod Gupta School of Management and Rajiv Gandhi School of Intellectual Property Law are such significant projects set up by the foundation in IIT, Kharagpur. Besides this, many educational institutions were established and run through charity activities of the foundation. While Ramrati Education Complex at Rampur Maniharan in Saharanpur Dist is run by the foundation itself, Dr Giri Lal Gupta School for Public Health and Dr Shanker Dayal Sharma Institute of Democracy in the campus of Lucknow University were established by the foundation and subsequently handed over to the university. 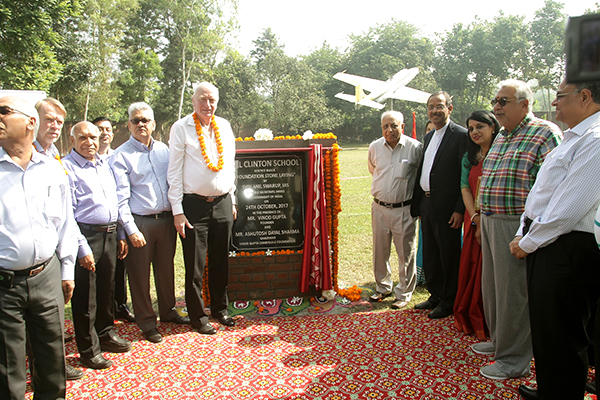 To fulfil its noble objective of providing quality education in rural India, the foundation chose Rampur Maniharan, a remote village in Western Uttar Pradesh, and established Shrimati Ram Rati Women’s Polytechnic in the year 2000. Keeping up with the need of times, subsequently, the polytechnic was upgraded to Ramrati Institute of Technology in 2012. Seeing response from the villagers around, other institutes were established, and a unitary campus turned into an education complex, which is now called Ramrati Education Complex (REC) comprising of Ramrati Institute of Technology, Bill Clinton School, Hillary Clinton Nursing School, Hillary Clinton Institute of Para-medical Sciences and Hillary Clinton Women Centre. The former President of United States of America Mr Bill Clinton has visited Rampur Maniharan in 2001 to lay the foundation stone of William Jefferson Clinton Science & Technology Centre constructed and run by the foundation. Vinod Gupta Charitable Foundation has contributed significantly to Wildlife Conservation in India. The foundation is actively involved at Ranthambore Tiger Reserve, Rajasthan, and has provided funds and material such as Jeeps, Motorcycles, Bus, GPRS Systems, Computers, Laptops, High-resolution binoculars, Professional cameras, Night vision devices, LED Lights, Jackets, Shoes etc. to the forest guards, rangers and guides working there. It has also constructed large water reservoirs, toilets and staff quarters at the Ranthambore National Park. The foundation is named after its founder Mr Vinod Gupta, an NRI and now a well-established entrepreneur in United States of America. He was born on 4 th July, 1946 in Rampur Maniharan, Uttar Pradesh and after completing his B tech from IIT, Kharagpur, he left for America to pursue his higher education and then permanently settled there. The Board of Governors of the foundation comprises of eminent people. The Chairman, Mr Ashutosh Dayal Sharma is the Chairman of Quest V.C Pvt Ltd and son of former President of India Dr Shanker Dayal Sharma, and Mr BK Goswami, Member Board of Governors and its first Chairman, is a Retd IAS and former Chief Advisor to Govt of UP and J&K.